We believe it is important for you to understand how easy it is to actually recover your deleted email. No need to panic - just simply use GetData's Recover My Email for Microsoft Outlook and Microsoft Outlook Express and we will guide you thru a 3-step process of getting your deleted or lost emails and attachments back. Should you have some additional or very specific questions that we are not answering within this Quick start Guide, please visit our Support Centre. Our skilled and friendly support staff will help you with all your questions. First of all you should close your Microsoft email program. 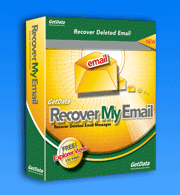 In a second step, you should take a copy of your email file/s, before you use Recover My Email. Use the copy as the file from which you will attempt to recover deleted email. In addition to having a backup, the benefit of this is that you can continue to use your existing email. 3. Test Recover My Email before you buy it! In the stressful situation of losing important emails and attachments one wants to have the reassurance that the software bought actually delivers the desired results: It recovers your deleted emails! For that reason we offer you to download our recover software and test it for free. The trial version performs exactly the way the full version does - the only difference is that once you can preview your recovered emails and you want to save them, you will be asked to buy the software.